OP25 is a program that decodes P25 Phase 1 and Phase 2 digital radio. Some municipal areas are upgrading to P25 Phase 2 so almost gone are the days that you can track them with a police scanner since P25 is a Trunked Radio system and not just a lone frequency to monitor. The only things that do Phase 2 are hardware scanners and hardware radios and OP25 for software radios. Bear in mind Phase 2 could be encrypted and nothing you can do will decode it. OP25 is HARD. I’m a geek and I messed with it on and off for a year or more and it whipped me more than once. Now that I have it working I find that it is REMARKABLY easy and I’m mad at all the geeks out there who never made a simple tutorial. There are tutorials out there, some good but everybody leaves out the good stuff or the stuff they took for granted. 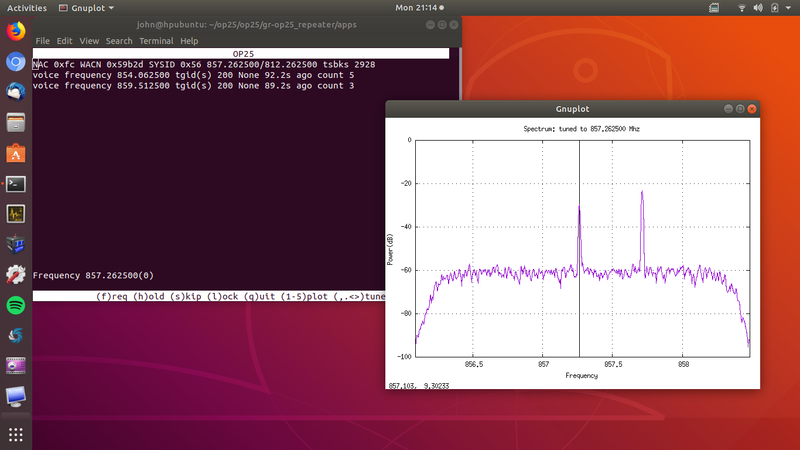 I’m kind of working on the assumption that you have Linux installed and have your SDR device working. In a pinch I guess the first thing you could do is to install gqrx which would pull in all the necessary RTL stuff you need. Follow the directions here if you need to. Yeah that’s a weird way of doing it but it’ll work and probably the easiest thing to do for a newbie. Wait a bit for it to install. It should take care of everything. Now it is installed but there are three obstacles to overcome. That’s basically it. Now my assumption here is that you are using a generic RTL-SDR device. I’m using a V3. These will set you back about $30 or so. But you only need one of these to track a trunked radio system. So plug in your RTL-SDR device and let’s get ready to do this thing. I’m going to demonstrate using my home town of New Bern NC. Lets find the trunked system to follow. Go to this page to list the frequencies. This page will not always be spot on. The actual control channel at the moment (they change it sometimes) is 857.2625. To find the control channel if you don’t know which one it is just open a program like GQRX and look and listen for the control channel. It will sound like digital noise. And the signal will be a constant spike. As you can see I found my Control Channel at 857.2625 as stated above. Now go back to your system and get in the correct directory. Check your path for accuracy. Now try this command IF YOU ARE SETTING UP A DIFFERENT FREQUENCY FOR YOUR TOWN MAKE SURE TO ADJUST THE FREQUENCY IN THE COMMAND. I ALSO FOUND I CAN DO THIS WITH AN ADALM-PLUTOSDR BY CHANGING THE –ARGS TO ‘plutosdr’. If you get a bunch of errors remove the last part of the command (-q -2) It works as above on my V3 SDR but not on my NESDR Smart. You may also have to adjust the -2 number depending on your individual SDR. Have fun with that. To further illustrate my SDR v3 works at -2, my NESDR Smart works with the -q -2 removed (0), and my Adalm-Pluto works at -q 5 (positive 5). You just have to play around until you get your signal centered on the plot. As per the pic below ………If where it says 857.262500/812.262500 is all zeros then you need to keep adjusting the -q number. On that screen you can start GNUPLOT by pressing the number 1 key. Keep messing with the q number until the signal is centered on the plot. Something like the box above should pop up. There won’t be any sound but take note of the NAC. In my case it is 0xfc We’re going to need that. Copy your NAC for your frequency. YOU WILL ONLY GET THE CORRECT NAC IF YOU ARE TUNED TO THE CONTROL CHANNEL YOU WANT TO MONITOR. Now open the file tompkins.tsv It looks like this. Make sure the settings are the same as depicted above. 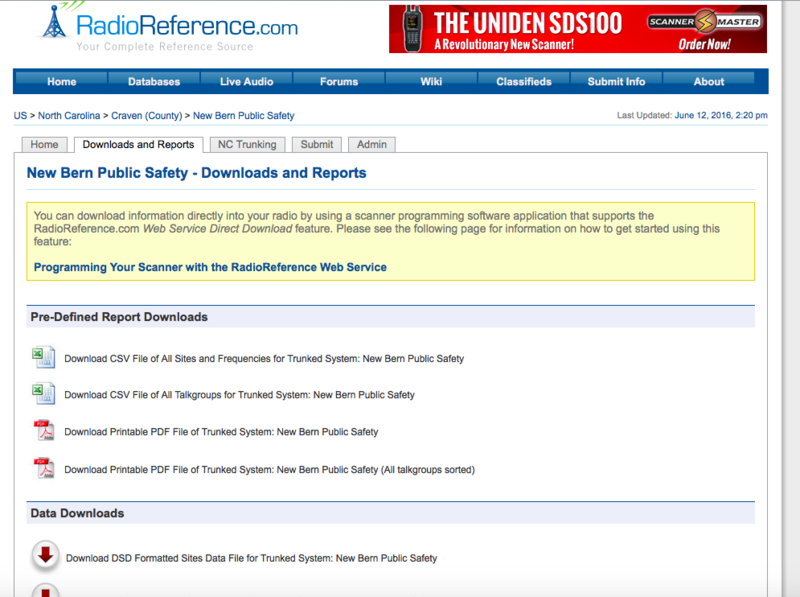 Delete all the filled in fields in here and go back to the radio reference.com page where all the New Bern frequencies were. 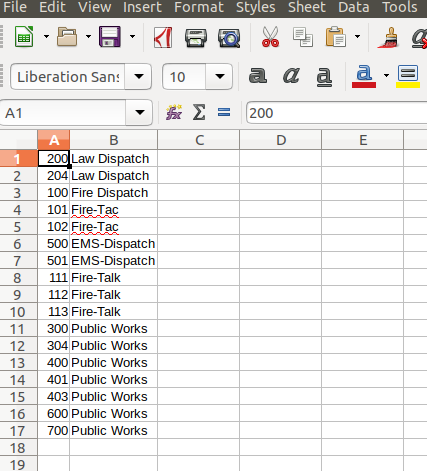 NOTE: TO EASILY INPUT TALK GROUP DATA GET A PREMIUM MEMBERSHIP AT RADIOREFERENCE.COM ($30 per year) AND YOU CAN DOWNLOAD SPREADSHEETS AND JUST CUT AND PASTE THEM INTO YOUR TSV FILES BELOW. I MERGED TWO TAG CELLS TOGETHER TO GET MORE DESCRIPTIVE INFORMATION, ESPECIALLY ON THE VIPER SYSTEM THAT HAS OVER 2000 ENTRIES. HOW’D YOU LIKE TO HAND ADD 2000 ENTRIES? Now go to the tompkins.tsv file that you cleared and type in column A the numbers in the DEC column (i.e. 100, 101, 102, etc.) Then in column B insert in the tag (i.e. 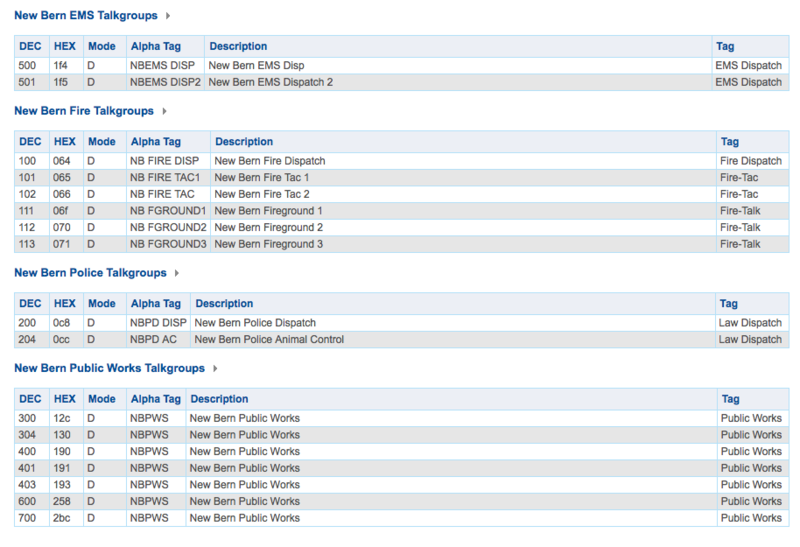 Law Dispatch, Public Works, etc.). Sorry mine are not in order. Sue me. Do a “Save As” and name the file newbern.tsv (remember that field in the other file you named newbern.tsv). Make sure this file is also saved in the same format as above and also in the apps directory where the tompkins.tsv file was. And now when there is a transmission on the Control Channel, OP25 will track it to the correct frequency and even display the talk group that is currently active. Now lets make a little script file so we aren’t forever typing long commands. Hit CTL + the X key then Y to save the file. Now make it executable. It will cd to to the right directory and run the command to start OP25. In the comments below Mr. Alex Bowman found an easier way to launch the program. Create an alias in Linux so that you just type “op25” (without the quotes) into the terminal from any directory. Then paste in the following lines. Be sure your path is right about. Note my path of /home/john. Yours is different unless your name is John, of course. Now hit Ctl key plus X, then hit Y to save. Restart the terminal and you should now be able to launch OP25 just by typing OP25. It works like a champ. I tried it. That’s it. I hope I made this easier for someone. And lastly here is a video of me using OP25 to track 2 Control Channels simultaneously. You’ll hear the transmissions echo in the video. 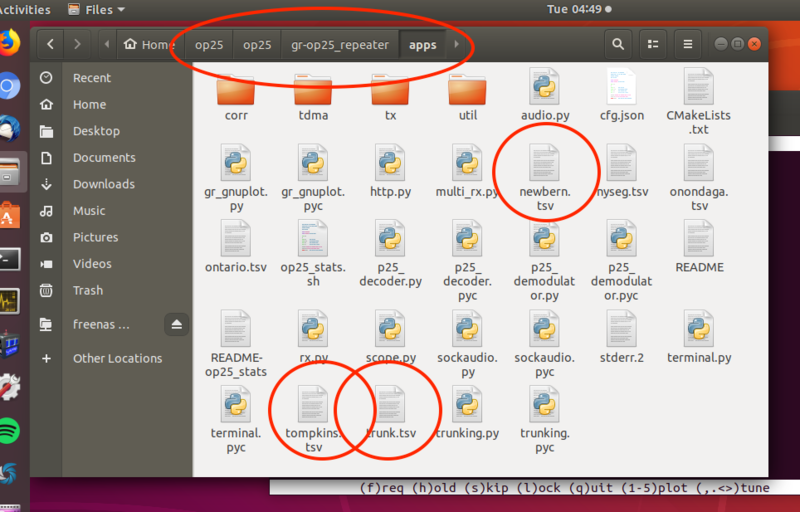 That is my screencast software recording both from the microphone and speakers and not the way OP25 sounds. On a final note just for fun I installed OP25 on a Raspberry Pi 3 B+. It works like a champ. I installed GQRX first which pulled in most everything OP25 needs and plus I use GQRX a lot anyway. OP25 takes a while to build on a Pi but it does build. If you look at the pic below the CPU usage is 40% however to get this picture I was running a VNC server as well so some of that usage is almost certainly the VNC session. This is a living document (for a while). If you find something I should add feel free to go to my contact page and email me. This entry was posted in Linux, SDR, Software on July 17, 2018 by John Hagensieker. Thank you. Runs great on a Tinkerboard. Monitoring Louisville Metrosafe. Used the standard RTL install procedures then I used sudo apt-get install gqrx-sdr and then sudo apt-get install libvolk1-bin and ran volk_profile. Then I followed all of your steps. And just for info the -n option in OP25 somewhere near the beginning of the will block the encrypted squeals that can cause loved ones to vote you off the island. I’m not sure why but this system has a better sound than others that I use and like. Thanks again, have finally found a use for this SBC that I had written off months ago. As an additional note my V3 is running off a powered USB adapter, not the Tinkerboard usb power. Can you point me for assistance on getting Unbuntu 18 onto a Pi? Thanks for great tutorials. Not only got op25 phase 2 running on my laptop under Ubuntu, but also got it working on my Raspberry Pi 3 perfectly! I have a question, I am using the -n switch to silence the encrypted stuff (works fine), but is there a way to block them completely? I find sometimes the encrypted “silenced” talkgroups, over ride the non-encrypted ones and I miss some of the information. I listen to the fire departments in my area, but the police who are encrypted are on the same control channel and I will sometimes miss the dispatch of a fire call because a “silenced” talkgroup is active. Is there a way around this by chance? Thanks again for taking the time to put this information together in a easy to understand format!! In your .tsv file you can set Priority but you’d have to know which talk groups the encrypted stuff is generally on. Set a low priority for it. ah, OK. I’ll give that a go then. I am getting a pretty good idea of which talk groups are the busiest and those will be my priority first. How can I set priority for a particular talk group in .tsv? The “blacklist” field in trunk.tsv tells op25 to skip a talkgroup completely and keep listening for other talkgroups; I have been putting the encrypted talkgroups on the local system in that field and it seems to work OK. See my reply further below for the details. I see all the comments about getting this going on RasPi 3 B+, but not the details on it. So could you please post the RasPi 3 B+ portion of the tutorial. A couple SDR dongles and a PI 3+ would still be cheaper than a $600 P25-PII scanner, or a $3K P25 PII radio and hoping you can keep it unaffiliated and unstunned. Check the later posts on my blog. I did just that. Do you have to setup a new line with the nac and the whitelist every time? Or just in the whitelist box you can have many many entries? I suggest you check some forums, lots of help there. Thanks for the write-up! I got an RTL-SDR a few years ago, when P25 decoding was not as far along as it is now. I started playing with it again recently and now I have a scanner – thanks! 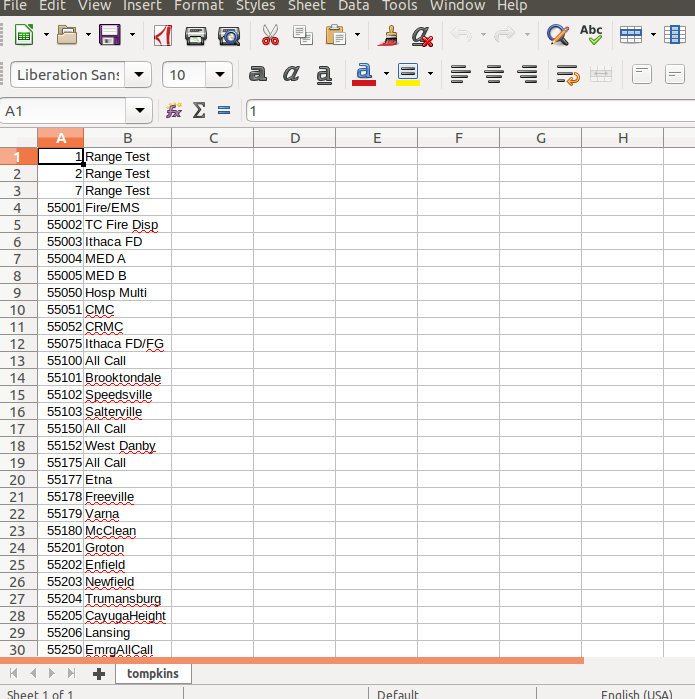 I found I could copy the text of the tables on Radio-Reference and paste it into LibreOffice. 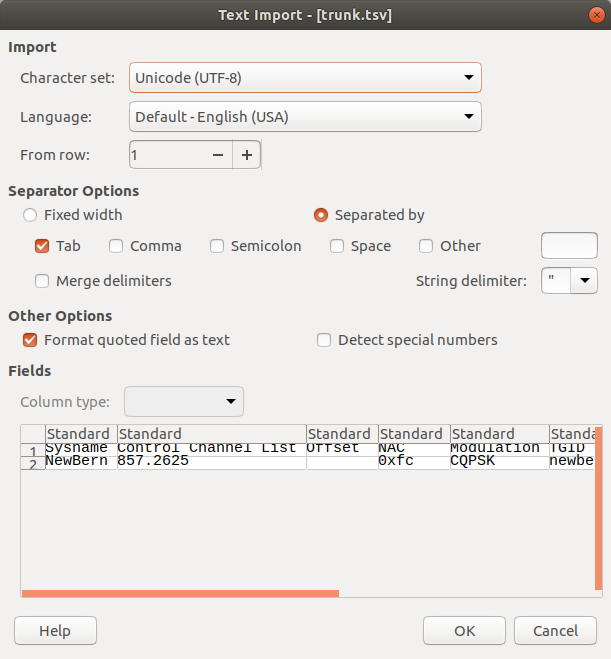 LibreOffice treats the paste like importing a text file, and breaks it up into columns and rows pretty much how you would expect. You can then cut it down to just the talkgroup ID (first column) and whatever you want to use for the description (second column), for the .tsv file that describes the system you want to listen to. Thank you so much for putting this information out there. I’m almost completely new to Linux and was able to follow along very easily. 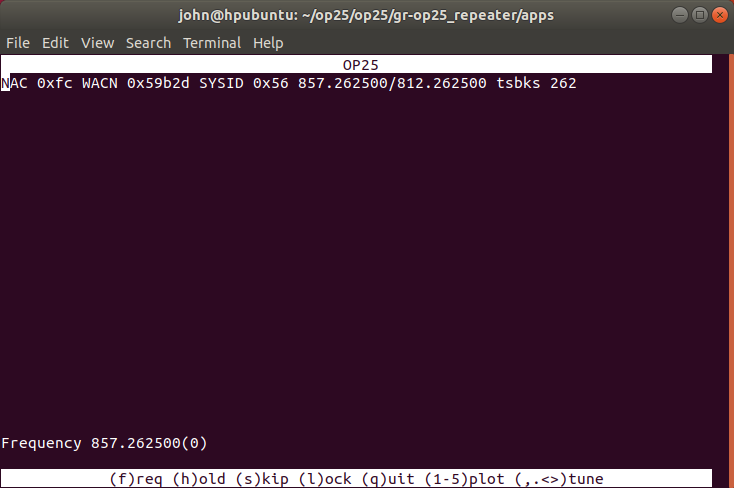 I was able to successfully get OP-25 running on Ubuntu 18.04 LTS with a RTL-SDR v3 dongle. Thank you again for this excellent writeup. 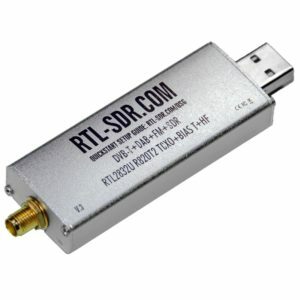 Is there an way to get OP25 to work with multiple RTL-SDR dongles? The reason I ask that is that I monitor the Ohio MARCS P25 system where the frequencies can span 6 Mhz. I would like to constantly monitor the control channel with a single dongle and let the others take care of bouncing around. The way it works today is that it will jump from the control channel to a listening channel to listen to a specific talk group. I generally hear one side of the conversation since the control channel cannot tell me then next channel for the reply in time. Another user will reply to a call for that talk group but will appear on a different channel. I will miss that since the control channel isn’t constantly monitored. Three dongles would suffice in this situation. I’ve been looking for many months but haven’t had much luck. The only think close would be trunk recorder, which is a path really don’t want to take due to its intense use of resources. Did it stop working for you on 2019.01.18? I just tried listening and I get errors in the stderr file. I went to make sure I was on the correct freq and it looks like the radioreference.com site updated on the 18th as well, which seems to be a huge coincidence. John, greetings from the Triangle. Your tutorials – especially this one on OP25 – were a great comfort during the recent storms. I recently bought an ADALM-PLUTO, and I’m finding a strange behavior – I can be zeroed right on the control channel, but the actual communication channels always seem to be too offset for me to recover audio. Have you seen such similar behavior on the Pluto? I have to set my Pluto at q 5 and then if it gets hot in the room have to set it to q 6. It’s kind of drifty but playing around with it a bit you should find the magic range. What a magnificent tutorial – *very* much needed – thanks again! Thanks for this tutorial. I can now listen to my county’s Phase II TDMA with a nesdr smart on MATE 1.20.1. I had to lose the “2> stderr.2” from the launch script in order to get it to work for me. I was also able to copy and paste the data from Radio Reference like Matt R. above. John, check out my blog post about using your instructions to successfully get this working! Thanks for the info! Outstanding write up. Thanks for sharing it here. It will only serve to help others get OP25 up and running with a Pi. I recently added a couple other blogs where I was playing around with DSDPlus and came to the conclusion that while DSDPlus is better eye candy, the superior decoder by a longshot is OP25. The fact you can run it on a Raspberry Pi is icing on the cake. to facilitate. I have tried sudo apt-get install, etc, but no good. Previously i was using Ubuntu 16.04 and it ran flawlessly. Any Ideas ?? Oh, just love your blog. Simple is better and as a Robotics Engineer, I have found many mistakes by backing off original thoughts and Keeping It Simple !! You can also go to that GitHub page and download the zip file and unzip it where you want it. I’ve got this working on my raspberry pi 3. Close terminal and open it back up. You can now run your command by typing op25 as soon as the terminal opens, without changing directories. for some reason the CTRL+X, Y, Enter was missed when I tried to post comment. Next time I launch OP25 on one of my Linux computers I’ll give that a try and then add it to the tutorial. Thanks! I also added another alias that starts my services, but I’ll post that on Part 2 as the alias covers other items than covered here, Works well if you have to log in VNC to run your commands. I using windows 10 and a RTL 2832 type unit wchich works under SDRSharp. Are you using a Virtual Machine of Ubuntu under Windows? I looked at your pic and I don’t think you are seeing your USB SDR device. If you are using Virtualbox you need to enable the USB device that is plugged in. You don’t need Virtualbox if you are using Linux already. OK…. so without VB what do i need to do to see the RTL ..? Is some other program using it? have you tested the SDR under Linux? By using GQRX or some other program? 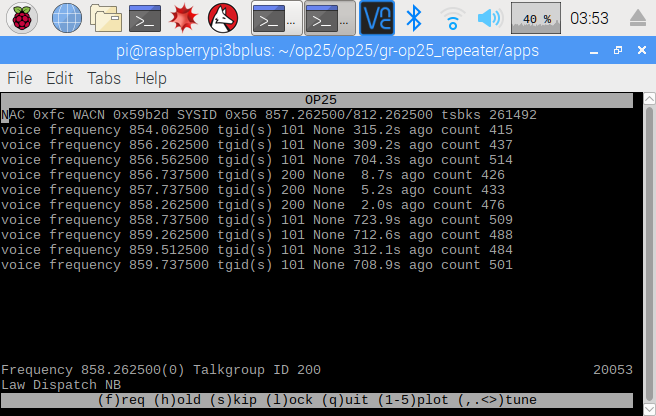 I have OP25 running on a Pi3, can see the control channel processing TGIDs, decoding voice, and showing TG alias, but it only lasts for a few moments. The program will still be displaying the stream of calls, but stops decoding voice. I am just a few hundred yards from the prime site, so signal strength is not an issue. I am really impressed with the audio decoding in OP25 but I cannot get it to last more than a few minutes, if that. Any suggestions? What size is the power brick you are using? I strongly recommend a 2 amp or slightly higher brick. Yes sir. I am using a 2.1a brick. I have messed with sampling rates and LNA and nothing keeps it going for more than 30 secs or so. I’m watching it change frequencies and display TGs as it should, but audio just stops dr oding. seeing 4 or so voice frequencies updating but no audio coming through? could it be the frequency drift on my sdr, it states a control channel for me as 168.100 on the website but im tuned to 168.0934 to get a good RX , could that throw out is tuning correctly to the frequency when it changes to grab the audio? I am confused about control freq and talk groups for LARGE systems. My county, Shelby County Alabama is a part of the Alabama First Responders Network. Shelby County Has 5 different control frequencies, see https://www.radioreference.com/apps/db/?sid=7258&siteSort=county#sites . Within the Shelby County designation, there are 40-50 talk groups. I obviously do not need to tune to ALL of these TG’s. Is each TG associated with a specific control channel or ALL control channels? My question is, how do I know which talk group is linked to which control channel, or does it matter? This guy explains whitelists (same could be used for blacklists) better than here. Mostly whitelist is priority, where blacklist ignores those TGs. What if you are trying to set up for a certain county in Zone 3 of the NC VIPER System? Anybody tried this before? I see the site frequencies for each site but nothing for the county in particular. So I am tuned to STARCOM21 773.84375c but only want to monitor two TG, 2609 and 2676. Do I have to put all of the other TGs in the blacklist even if i’m using the TGID Tags File with only two TG like we have here in the instructions? I had this running in one shot, awesome instructions!!! very newbie here. can you tell me what I would need to use the Texas Wide Area Radio Network (TxWARN) Motorola? ?